Hitting close to home, and too close some residents, when a fire broke out in the 1200 block of page yesterday. 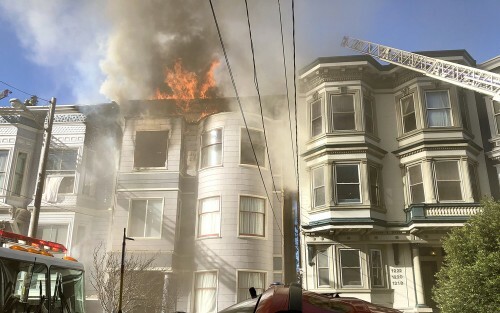 Around 3pm San Francisco Fire Department (SFFD) responded to a 911 call that a fire had broken out on a block of Page Street in the Haight Ashbury, close to Buena Vista Park. The fire, which began in the building housing apartments in the 1226-1236 Page, set off an explosion. Windows shattered and the fire spread along the front of the building and began scorching the roof. Thankfully SFFD’s response was quick as the fire was contained by about 4pm. Despite fire damage to the most of the building and the some of the adjacent building to the west, all 14 residents were declared safe. Those at home evacuated quickly, but had tobear the horridic image of watching their home burn away. Resodemt pf tje adjacent building were able to return once the fire was extinguished, but residents of the burned building turned to the Red Cross for help.